LEWISTON – Jacqueline McCarthy Nadeau of Lewiston, known to all her family and friends as Jackie, passed away on Sunday Dec. 16, 2018, with her loving family by her side, including her beloved husband of 69 years, Guy Nadeau, following a long courageous battle with dementia. She was born in Lewiston on March 21, 1929, the daughter of the late Eva Mathieu Simoneau and Bernard McCarthy. Jackie had been a resident of Lewiston all of her life. She attended the Ave Maria Academy in Sabattus and graduated from Lewiston High School in 1947. She married Henry Guy Nadeau on Aug. 16, 1949. Jackie and Guy opened Friends Catering, and later acquired Nadeau’s Market (which was operated in the neighborhood by Guy’s parents for over 40 years) to open Friends Deli and Catering in the 1960s, which they owned and operated for over 35 years. The well-known Lewiston business served people from all over the region from their location on the corner of Walnut and Bartlett Streets in Lewiston, catered countless wedding receptions among other joyous occasions, as well as large gatherings, including many Democratic Party Jefferson-Jackson Day dinners, often attended by more than 1200 guests. Jackie was a full partner in the business while raising their four children at her home of 62 years, on Simard Avenue, in Holy Cross Parish. After her retirement from the business, she was also employed as a customer service representative at LL Bean until 2005, a job which she enjoyed immensely almost as much as she enjoyed the people with whom she worked. 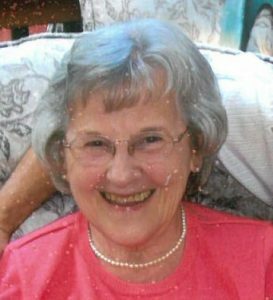 Jackie derived great pleasure and satisfaction from raising her children and enjoying time at the family homestead, where all gathered frequently with her eight grandchildren and nine great-grandchildren. She was devoted to her family and a source of great strength and inspiration, not only to the family, but to her many friends and extended family. Particularly dear to her were Guy’s sisters, who became Jackie’s sisters, in her youth, and to this day. Dolores Moore of Toms River, N.J and Claudette Sirois of Auburn. She is survived by four children, Philippe Nadeau and his wife, Marcia of Bradenton, Fla., Gregory Nadeau and his wife, Diane of Lewiston, Monique Gagne and her husband, Eugene (Geno) of Greene and Michelle Roberts and her husband, David of Lewiston. She was predeceased by her father, Bernard McCarthy, her mother Eva Mathieu Simoneau and her step-father, Larry Simoneau. The family wishes to thank the “staff of angels” at Clover Manor, who provided Jackie with wonderful care since her arrival there with Guy. Also, special thanks to Androscoggin Home Healthcare and Hospice for their extra special care. A Mass of Christian Burial honoring Jackie’s life will be celebrated 1 p.m., Saturday, December 22, at Holy Cross Church. Committal services will be held later in the spring. Family and friends are invited to visit Friday, December 21, from 4-7 p.m., at the Pinette Dillingham & Lynch Funeral Home, 305 Alfred Plourde Parkway, Lewiston.